Iran scraped a win in their opening game against Morocco but will struggle against the Spanish. Spain should open up the Iranian defence at will, with their possession-based football likely to tire out Iran. Betstar has Spain at odds of 1.15 to win and in reality, the European side should cruise through this fixture. Spain will come out the traps flying and will look to make a fast start. Ladbrokes has the Spanish at 5.8 to win 3-0 and this a very possible scoreline. Once Spain have a lead they will look to hold onto the ball and wait for Iran to make mistakes. Hierro’s men should pick Iran off with ease without needing to get into top gear. The gulf in class between Iran and Spain should see over 2.5 goals scored and punters can find that with William Hill at odds of 1.67. Given that Spain scored three against Portugal, they should be able to rack them up against Iran. Iran aren’t prolific scorers and have only managed three goals in their last three games, one of which was a Moroccan own goal. No matter what way you look at it, you can’t see them finding the back of the net against Spain. Crownbet are offering odds of 1.35 for both teams not to score. Spain find themselves tied on points with Portugal and will want to go top of the group with a win against Iran. Iran’s time at the top of Group B is surely limited with a clash with Portugal following after Spain. There is a strong chance Iran won’t add to the three points they have now. In the 2018 FIFA World Cup Group B second round of fixtures, Spain are looking to secure a victory over Iran to qualify for the knockout phase of the tournament. With another two very strong sides in the group in Euro 2016 Champions, Portugal, and African Cup of Nations Champs, Morocco, the outcome in this match could prove critical to see which teams progress to knockout play from Group B. The two teams have never previously met in a full international. Spain powered through their UEFA Group G World Cup Qualification matches and were unbeaten in a powerful group that included shock non-qualifiers Italy, Albania, Israel, Macedonia and Liechtenstein. Spain played attractive football along the way pounding 36 goals in 10 matches whilst only conceding 3 times. The highlight was a bright and breezy 3-0 win over Italy at the Santiago Bernabeu in Madrid. Underestimate Iran at your peril. Spain will need to be watchful of Iran on the counter attack. Since the last World Cup, Iran have scarcely lost a match that mattered, and they were undefeated in the second round of Asian World Cup qualification. Iran have a defence that kept many clean sheets through that qualification process, allowing only 2 goals to Syria in their drawn final qualification match. Iran secured their qualification extremely early on with the quality of their qualification form (particularly away from their Tehran home) as just the third team to seal their berth at the World Cup, behind hosts Russia and five-time champions Brazil. 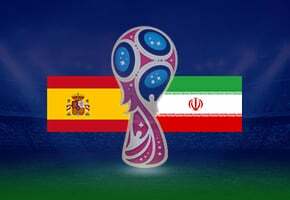 Iran vs Spain – Should i Bet on Spain? Iran come into this contest having led Group B after the first game. They weathered the storm of Morocco’s fast-paced attacks until they eventually broke through late in the game. A free-kick down the side of the box was headed in for an own goal. Spain engaged in a battle with Portugal that lived up to its billing. From being 1-0 down early on via a Cristiano Ronaldo penalty, Spain battled back with the likes of Isco, Iniesta, David Silva, and Diego Costa showing off their talents. But, with Spain 3-2 up, Ronaldo won himself a late free kick on the edge of the box. As you would expect, he scored to seal is hat-trick and finish the game 3-3. For this match-up, Spain is the heavy favourite with Iran at 26.0 to win with Crownbet. Against Portugal, Spain proved that they have incredibly talented and flair-filled players who can combine for goals. Costa flexed his muscles, Isco showed off his footwork, and even Nacho joined the scoring with an epic strike to make up for giving away the third-minute penalty. Iran relies on staunch defending, tight structure, and set pieces to stay in the game. Against Morocco, they did well in the first 20 minutes to keep their opponents off of the score sheet. Against Spain, they won’t get so lucky. Spain will attack with many clinical finishers at once and should score multiple goals while keeping out Iran. Spain to win -2 is at 1.25 with William Hill. David de Gea had a forgettable night in net against Portugal. But, then again, Ronaldo was in the form of his life. It’s hard to stop someone of Ronaldo’s quality when he tastes blood in the water. The Spaniard will be out to prove something against Iran, as will the Spanish defence. It’s hard to see them making the same mistake as Morocco did and will simply push the attack until Iran are beaten into submission and forced to defend. For Spain to win to nil, Betfair give odds of 0.16.